It’s so important to pick a right stroller or pram. When you pick a stroller or a pram you want to make sure that it fit to your activity and usage or lifestyle. I’m not lying when I say that it’s a big event to buy the first stroller or pram for many prospective parents. A stroller/pram is not just a stroller/pram. As mention it have to meet your needs and your family. Are you city peoples, do you travel a lot with car, or do you like to take long walks in the nature? In the city or on the country? In an apartment or a house? Is it a lot of driving involve? Are you mostly outside in the nature or cafe? Do the baby sleep with day mama or in kindergarden? How about orientation? Face forward or against? Which Type of Wagon Is There To Choose? Combi wagon: A wagon where you can have the bag upon the sport wagon part. You push the two of them at the same time. When the baby is bigger you can just take of the bag part and go with the sport part. Duo wagon: A wagon with a bag part installed and when the baby is bigger you can replace the bag part with a sport part. Bag wagon: The traditionally bag wagon no sport part. The seat has plenty of space. The stroller weight is light for easy transport and storage. The wheels are big for stability when jogging or the terrain turns tough. Easy to steer when swiveling front wheel allows super maneuverability. Adjustable handles. Comes in handy when it depends on the heights of the person who’s pushing the stroller. The sun may be an issue. Because the sun shield don’t completely protect against the sun. But there are ways to solve this, you could use a parasol or cover clips (blanket clamp). Not a lot of room for storage underneath. Missing place to store things on the handlebar. To resolve this purchase the handlebar storage accessory. 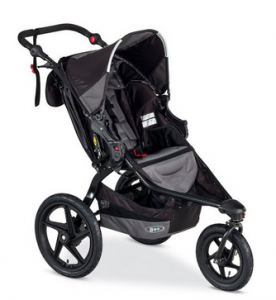 BOB Revolution SE Single Stroller is perfect for parents who love to excercise with baby on a jog. But it’s really fits for everybody! 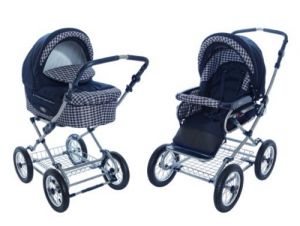 2-in-1 stroller with bassinet and seat. Adjustable features: Handle, backrest and footrest. Easy to fold for transportation, also easy to unfold. Raincover and mosquito net is included. Smooth ride to use all year around. The weight could be an issue to parents who live in apartment without elevator. The pram could take some space in the back of the normal size sedan car. Enjoy a smooth ride for your baby. The stroller/pram is comfy and the bassinet and seat have good space. Rating 4.7 of 5 says a lot of costumer review. It not only worth every penny, but you also save money. This is because you get a 2-in-1 bassinet and seat. The list price is $780 and you get it for $498 + 68.09 for shipping. It means you SAVE $282.00 (36%)! It’s been quite some time since I needed a baby stroller, so I am amazed at how they have evolved over the years. They are like baby Cadillacs with price tags to match! Thanks for the post….I’m hoping to have grandchildren soon, so this will come in handy. Strollers will develope and evolve as long as we’re going forward I believe. Thank you for stopping by my site and for the comment.